Directly to the north of Downey lie the San Gabriel Mountains, topping out at just over 10,000 feet. When we show you a view of the snow from Downey (Magical snow), you're seeing the San Gabriel Mountains. But the mountains that typically receive the most snow are the San Bernardino Mountains, further to the east. With elevations at around 11,500 feet, these mountains hold the ski resorts that people most often head to. So with last weekend's snow in mind, four of us (and two dogs) played hookey on Monday and headed for the San Bernardino Mountains. After driving up the mountain through a thick blanket of fog, we found enough snow to play in at Running Springs (6,100 feet). We had fun, we got wet and cold, the dogs caught snowballs—and I didn't take a single picture until we headed back down the mountain. 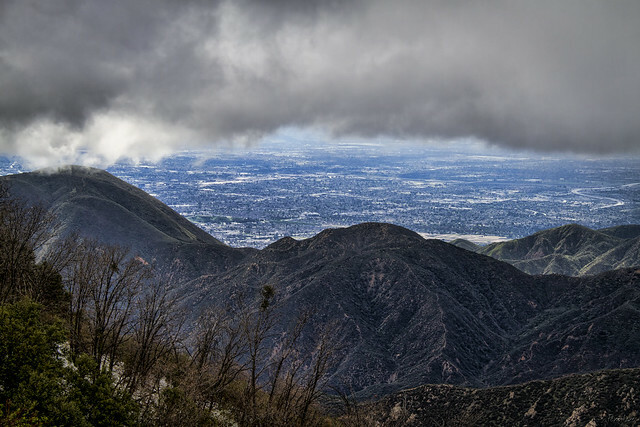 So here is the spectacular view of San Bernardino, from the San Bernardino Mountains, at the end of our snow day. It's been several decades since I've been to those mountains, and most of the time there wasn't snow. But I did enjoy the hiking on my frequent trips to Forest Home in Forest Falls during my youth, and they usually trucked us to wherever any snow might be.